Excellent Resource! - Neighbors at War! No Comments on Excellent Resource! A few weeks ago, I ran across an excellent resource for anyone curious about the Homeowners Association experience. 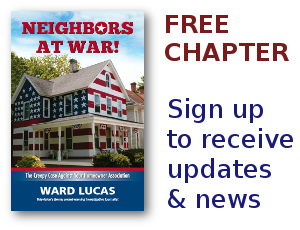 His website is still under construction, but Robert R. has been through the HOA meatgrinder a couple of times. He’s one of the few people who’s ever actually won a lawsuit against the parasites in the legal profession who’ve turned HOA life into a nightmare for hundreds of thousands of Americans. Since his site is still under development, I’ll let him tell his own story if he chooses to do so. But what really intrigues me is that Robert has done a well thought out comparison between Right To Work laws and an imaginary Right To Own law. Do you have a right to work without being forced into a labor union? About half our states say you do. Do you have a right to own your own home? No states say you do. In fact more and more states are ordering real estate developers to force all buyers into deed restricted corporations in which each homeowner is technically a member/partner. In other words, you own your home WITH your neighbors. And you, in essence, own a portion of each of your neighbors’ homes. Now just think of one nightmare scenario to see the potential problems that can and do arise. A jury awards a huge slip-and-fall civil award against your HOA. Guess who pays? Well, my partner, my buddy, my friend. You do! Get out your checkbook and prepare to write a big one for the pending special assessment.